We are doctors that have been opposing attempts to argue junior doctors out of statutory whistleblowing protection. We are are a group of doctors who are deeply concerned about this tragic case which has serious ramifications for NHS healthcare professionals and patient safety across the United Kingdom. We feel for everyone involved in this terrible situation and want to help. We are raising funds so that Dr Hadiza Bawa-Garba, a junior doctor involved in the death of a 6-year-old in horrifically challenging circumstances while under extreme pressure amidst a series of systemic failings, can be offered additional independent expert legal advice in respect to challenging the decision that she be permanently erased from the medical register. We are also seeking advice about her criminal conviction for gross negligence manslaughter. The case is important for all NHS staff that are working in increasingly challenging circumstances. Dr Hadiza Bawa-Garba is a junior doctor who was part of a clinical team looking after Jack Adcock, a 6 year old boy who died of sepsis at Leicester Royal Infirmary in February 2011. The tragic events of that day and beyond are detailed in an account provided to 54000Doctors by senior paediatric consultants which can be read here. For large numbers of the medical profession who have read this account, the clinical circumstances surrounding Jack’s death sound exceptionally horrific, with Dr Bawa-Garba struggling against all odds to keep her young patients safe and undertaking the roles of 3 or 4 doctors in the absence of her supervising clinical consultant. It seems clear to us that even the most competent junior doctor would struggle to keep children safe under such conditions. A subsequent investigation at Leicester Royal Infirmary confirmed serious systemic failings, reporting 23 recommendations and 79 actions to be undertaken. Dr Bawa-Garba continued to work as a paediatric junior doctor following Jack’s death, and was acknowledged by many of her peers as performing her work to a high standard. In December 2014, almost four years after the events in question, Dr Bawa-Garba was charged with gross negligence manslaughter. She was convicted and given a 2 year suspended sentence in November 2015. Following Dr Bawa-Garba’s conviction, the independent Medical Practitioners Tribunal Service (MPTS) ruled that she was a competent doctor who made mistakes in the context of serious systemic failures, and recommended that she should be allowed to continue to practise medicine. The General Medical Council (GMC) appealed the MPTS’s decision, and on 25 January 2018 the High Court allowed the GMC to permanently erase Dr Bawa-Garba from the medical register. Dr Chris Day watched the GMC case in the High Court and has written a blog about the worrying way the GMC argued its case which can be read here. "This case is crucial to patient safety and as those supporting Dr Bawa-Garba we would welcome a fully independent legal opinion"
Dr Bawa-Garba’s case has extraordinary ramifications, with large numbers of doctors recognising that her conviction puts all doctors at risk in the context of a healthcare system which is clearly bearing enormous stress at a national level. The case also has implications for patient safety across the UK, because healthcare professionals will henceforth be reluctant to share knowledge openly or reflect on clinical errors for fear of criminal prosecution. What legal action are we taking? We have been talking with the fantastic group of doctors – including senior paediatric consultants - who have been supporting Dr Bawa-Garba through her legal battle during the last few years, and we now understand the extraordinary circumstances surrounding her conviction and the legal arguments advanced in her defence by the Medical Protection Society (MPS). These doctors have accepted our offer of instructing leading Queen’s Counsel to provide expert advice on whether the the criminal conviction and the GMC striking off Dr Bawa-Garba can be challenged. It is important to emphasise that Dr Bawa-Garba cannot herself request an independent legal opinion because she is represented by the MPS, and we have therefore not sought her permission. Drs Moosa Qureshi, James Haddock and Chris Day have formally instructed Tim Johnson/Law on this matter. We have the utmost sympathy for Jack’s bereaved family, and we hope also that during this process, the true circumstances behind Jack’s tragic death will be uncovered, and that the medical establishment will make an honest and courageous decision to make wide-ranging systemic changes across the UK and ensure that these circumstances never happen again to another innocent child. "I am relieved by the results of the MPTS but we will always remember that the centre of this case is the tragic death of Jack Adcock. I want to use this opportunity to thank all of you for your support throughout this journey as this was key in getting us to where we are today. I am overwhelmed with gratitude for your continuous support and prayers." We will keep you updated on Dr Bawa Garba's next steps and would like to offer our gratitude to those that offered their support to this case. We warmly congratulate Dr Hadiza Bawa Garba, her family, her legal team - as well as her many supporters around the world - on the Court of Appeal decision heard today, which has rolled back the High Court decision to strike Dr Bawa-Garba off the UK medical register. This case provoked a rapid parliamentary review of the GMC, and as a result the Government have already announced their intention to strip it of its right to appeal decisions of the Medical Practitioner’s Tribunal; we welcome this. However, stripping the GMC of their right of appeal does not address the manifold failings that has led the profession to lose all confidence in the regulator. This is a good day for the profession and the right outcome for Hadiza, but we still have work to do. We strongly suspect, as many of our colleagues do, that the original conviction represents a miscarriage of justice. It is our hope that her legal team will now focus on an examination of the conviction, and if possible, challenge it. That decision will be for Hadiza and her lawyers to take. We wish Hadiza all the best going forward – whatever path she chooses. It is now time for Dr Bawa Garba's appeal to be heard. In 28 days, 11,079 supporters donated £366,289. Dr Bawa Garba has so much support and we wish her and her legal team every success in the Court of Appeal. The world is watching the GMC. Please visit the Tim Johnson /Law website for details of the hearing and to read about what happens in court. The British Association of Physicians of Indian Origin to Intervene (BAPIO) have instructed Karon Monaghan QC to apply for permission to appeal as an interested party in the Dr Bawa Garba appeal. The initial phase of Hadiza's crowdfunding is now complete; the Crowd Justice page is closed to further donations. The response has been unprecedented. In 28 days, 11,079 supporters have donated £366,289 against a target of £200,000. The profession is galvanised. Our voice has been heard. I am truly humbled by the generous support, prayers and words of inspiration that we have received from around the world. Words alone cannot convey our gratitude. An appeal to challenge the High Court decision to allow the GMC to erase me from the medical register. Looking at all legal options surrounding the original gross negligence manslaughter conviction. Asking a Queens Counsel to provide all healthcare professionals with a legal review of what has happened in my case. We will update you via Crowdjustice with important developments in the case. If you have any information you think might be helpful to Hadiza's legal case please e-mail to info@teamhadiza.org and it will be treated in confidence. Today, Dr Bawa Garba's legal team lodged an application for permission to appeal at the Court of Appeal to challenge the High Court decision allowing the GMC to erase her from the medical register. It included an application to expedite the hearing. We would like to thank all those from around the world that have offered their support to Dr Bawa Garba. 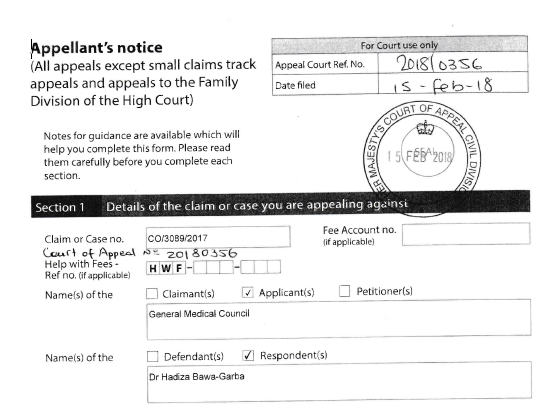 As a result of the generous crowdfunding, Dr Bawa Garba has now instructed two barristers for her proposed civil appeal against the High Court decision to allow the GMC to strike her off the medical register. James Laddie QC has been instructed with Sarah Hannett. James Laddie QC practises principally in the fields of employment, discrimination law, commercial law and civil actions against the police. Last year he successfully won back the right to statutory whistleblowing protection for junior doctors and agency workers in a landmark Court of Appeal case. He also provided an opinion on the increasingly contentious whistleblowing protection in the recently imposed junior doctor contract. Sarah Hannett practises in all areas of public law, equality law and human rights. She is ranked in Chambers & Partners in five practice areas: education, administrative and public law, civil liberties and human rights, local government, and community care. Legal 500 ranks Sarah in education law and in public and administrative law. Dr Bawa Garba’s legal team are in the process of considering which specialist lawyers to instruct in respect to the manslaughter conviction. We can confirm that a transcript of the Crown Court proceedings has been ordered. On behalf of Hadiza Bawa Garba, we would like to update you all about the latest progress. Your amazing generosity has allowed us to move on significantly. A group of doctors met with senior staff today at the GMC to express our feelings. Hadiza has made the brave decision to change her legal team. We would like to thank all of those who have helped us so far. We have instructed Tim Johnson Law to take over the management of this case, and to advise about the most appropriate Queens Counsel to use. Recruiting a leading Queens Counsel to explore the legal options surrounding a challenge to the GMC decision to erase Hadiza from the medical register. Asking a Queens Counsel to provide all healthcare professionals with a legal review of what has happened. Thank you once again for all of your support. This will be a very lengthy and complex legal process, and we will keep you updated. I am overwhelmed with gratitude for the response to the crowd funding campaign. This tragic case raises some important questions. I share all of your concerns about the implications of this case and the GMCs actions on future patient safety. In the light of this huge outpouring of support, I plan to use your generous funds to change to a top independent legal team, to potentially challenge the GMC and to have an independent review of the original conviction. I am truly humbled by what you have done for me. This decision will free Hadiza to seek the best Queens Counsel to fight her case, but it also opens her up to enormous potential cost liabilities. Please continue to donate generously. CrowdJustice money can only be spent on legal fees, and your donations will make a significant difference to how much Hadiza can achieve. The more we raise, the more her team can do. There are tremendously serious legal and healthcare issues raised by Hadiza's case which will affect all healthcare professionals and patient safety as the NHS is increasingly put under stress. We have been overwhelmed by the response to this crowdfunding campaign and are grateful to all that have donated and promoted this appeal. We are in regular contact with the team of doctors supporting Dr Bawa-Garba and will update you with what they think the next steps should be given how much support there is for Dr Bawa-Garba.